Many of you Divi users were surprised about Divi not allowing to show comments on pages. I didn´t notice at the beginning because I didn´t need to show comments on pages for this site, or for any other client sites where I was using Divi. But then I started receiving comments and emails asking why is this so and how to fix it. One of my readers even said: “This issue with Divi is very annoying for me, so I hope there will be a fix soon“. I will address this in the next update of the Divi Children plugin. However, I don´t want to make you wait until the next release of the plugin, so I´ve decided to write a little tutorial to show you how to get comments on pages working in the meanwhile. First of all, let´s make clear that it´s not true that Divi can´t show comments on pages in general. 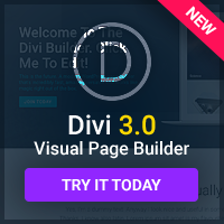 But it is true that there is no option to do it for pages that are built with the Divi Page Builder. Now you need to allow comments for your pages on a case to case basis. You may want comments on some of your pages but not in some other, like on your homepage for instance. When editing your page, you first need to make sure that the Discussion box is allowed to be shown. To do so, open the Screen Options panel and check “Discussion“. Now find the Discussion box and check the “Allow comments” option. Remember that this setting will only be applicable to the page you are editing. If your page is not using the Page Builder, you will be able now to see the comments section appearing on the bottom of your page as soon as you save it and preview it. But what about pages using the Page Builder? If you allow comments for a Divi page as we´ve just seen but you used the Page Builder to create the page, you´ll notice that comments won´t show up anyway. 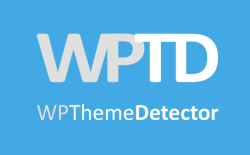 I don´t know the reason why Elegant Themes decided not to allow comments in this case. I guess it has to do with styling of comments not looking good on many pages built with the Page Builder. But what I do know is this: the code used in the page.php template file of Divi makes sure that comments will not be shown on pages when the Page Builder is used. See that $is_page_builder_used variable? That is the culprit. It gets the true value when the Page Builder is used for the page to be displayed, or false otherwise. If the Page Builder is not used for the current page and comments are allowed for the current page and the option to show comments on pages for the Divi theme is enabled, then load the comments template on this page. The comments template is the WordPress core piece of code responsible for showing the comments and the comments reply form, among other things. So, as soon as at least one of the conditions chained by the and operators is not satisfied, comments will not be shown for that page. That easy. But, since I am a convinced advocate of child themes, I strongly recommend you not to modify any Divi file. It will be overwritten next time you update Divi. Instead, use your child theme. What? You are no using a child theme for your Divi site? What are you waiting for? 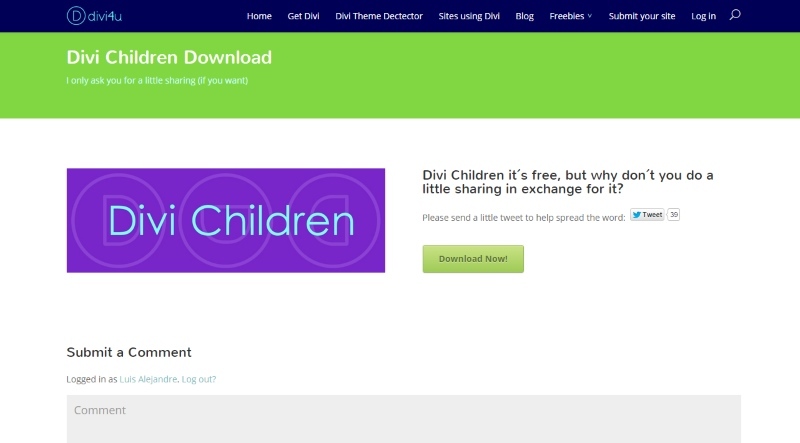 Go download the Divi Children plugin and create one in seconds! Now seriously, instead of editing the original page.php, copy that file and paste in your child theme folder. Then modify the new child page.php by changing the line I´ve showed you above and you´re all set. WordPress will load the modified page.php template from your child theme instead of the original one from the Divi parent theme. 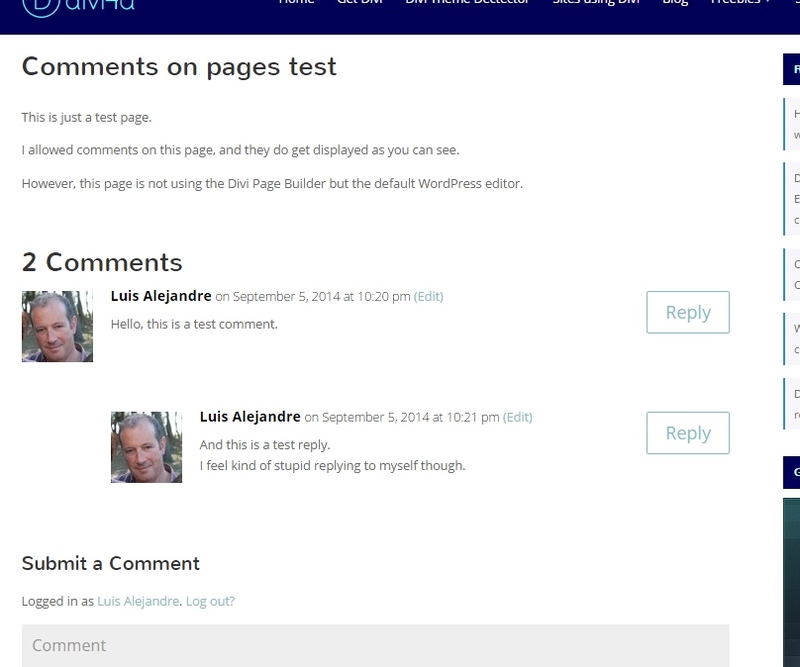 And comments will be shown, even on pages using the Page Builder. If we just modify the page.php file as explained above without doing anything else, we will see that comments are displayed on any page we allow them to be shown. But in the case of pages which make use of the Page Builder, we´ll notice there´s a styling problem. Do you like that? I don´t either. Not at all. But don´t worry, it can be fixed very easily. There is a very easy way to solve the appearance problem. We just need to force the comments area to be displayed with a maximum width value that can´t be exceeded. That and, for most users, also force it to be centered on your screen (otherwise everything except the Submit or Reply buttons would appear left-aligned). It´s a piece of cake. All we need is to just add a little CSS to our stylesheet. Psst, not that one, not the Divi stylesheet! I told you, use a child theme! Of course, you can change the values shown on those lines. I´ve used 1080px as it is the default page width in Divi, and 25px for the vertical margins, which you can change to any desired value. But you need to make sure you have the auto value for the horizontal margins if you want your comments to be centered on your screen. As for the top padding, give it any value that makes the page look good to you. It looks much better now, doesn´t it? This has been added to my toolbox for the implementing on all new sites divi-developed. At least until you’ve incorporated into the update you’ve referenced. Like you, 99% of the time the sites I develop utilize ‘pages’ for static-content, rather than anything dynamic or otherwise looking for comments from readers. But ‘not’ having that ability without your suggestion isn’t so good either. With that said– Thanks again. People like you make me feel always motivated to keep on working. Thanks for your encouraging feedback. If I understood your comment on my other post right, you´re not even able to show comments on posts either. I´m I right? On my site i use Disqus comment system – finally it works but there is a mentioned problem with styling . I tried to modify #disqus_thread width but with no success. I´ve visited your site, modified #disqus_thread max-width via “inspect element” in Chrome and it does work. Did you solve it? Where can I find that #disqus_thread max-width ? I visited your site and it´s not centered but left aligned. However, it looks like it is kind of centered because you gave the comment wrapper a maximum width which is too narrow (540px). Increase the number of pixels for that max-width (or make it 1080px directly) and you´ll see how it goes left. Sorry I didn´t get what you meant. The best way to achieve that would be to add a second wrapper div having the the desired width and enclosing everything under comment-wrap, but you need to modify a php template to do it. The problem to get the correct left alignment is this: if you specify a left margin other than “auto”, the position of your comment section will depend on the width of the screen, so it would look different on devices having different screen sizes. By the way: this comment section is narrower because the page has a sidebar, even though you don´t see it this far down the page. Great post and you finally convinced me to adopt a child theme. However, I followed your instructions by pasting the 2 pieces of code into the style.css sheet and nothing. I also searched for “pagescomments” in comments.php, which you mentioned is the part of the “broken” piece of code that is preventing comments from being rendered on the discussion page -and it was nowhere to be found. Any chance that the new Divi version needs something else to make comments reappear? If so, I’d love your help if possible! Actually, just found this comment on Divi’s forum and it showed a resolved tickey -but still no success for me. And that one is dated Dec 2nd -so the date really can’t be blamed! That is exactly the same code change I posted. But your problem is this: you mentioned that you followed my instructions “by pasting the 2 pieces of code into the style.css“. As I explained on my post, that php line should be modified in page.php, not in the stylesheet. Copy the original page.php file from the Divi parent theme and paste it in your child theme folder. Then modify the new child page.php by changing that php line. Amazing! Thank you, Luis. I was hunting through the divi parent code to try and find out why comments.php was not included. Google searched and Elegant Themes documentation talks about “Just click on this option and comments will appear in Divi”… well they flipping well don’t if the builder has been used! I’ve followed your instructions and now I’ve got comments appearing just where I need them. Very good post. I was looking for a solution long time ago. all the pages displays now the “insert your comment” form. but the comments form is still appearing in the homepage. Did you uncheck the “Allow comments” option on the Discussion box for the page(s) you don´t want comments on? In the rest they are checked, but there is no difference, a comments box appear at all pages. I was able to get it working following your steps, except for the amendment of the PHP file. Latest version of Divi and this fix still works like a champ. Hi Luis, when I go to my child theme, it doesn’t have the “single page” (page.php) option. How can I make the modifications then? Unfortunately this doesn’t fix the comment “module” as it simply shows 0 comments. I’m still looking at a way to fix this but after several years I doubt a fix will be made for this issue. I mean what good does the comment module do if it simply doesn’t work. yet Elegant Themes being Elegant Themes they keep overbloating and making DiVi more visually “impressive” that chrome can’t even run it normally anymore.